I didn't want you all to think we had a bad taste in our mouth about Dark Cornish chickens. Sure, they're inefficient at converting feed to meat and can't forage to save their lives, but the flavor is phenomenal! We roasted up one of our cockerels, and it turned out as juicy and tender as those rotisserie chickens in the grocery store. The last couple of times we've killed and eaten our own chickens, we thought we'd get the best flavor by eating the meat as fresh as possible. Since then, I've read that it's best to let the chicken sit in the refrigerator for a couple of days so that rigor mortis can relax, tenderizing the meat. I suspect the two day wait was part of the reason our latest home grown chicken was the best I've ever tasted. That's really interesting about the rigor mortis. My mum, who grew up in a small town in a time when there were milkmen, often talks about how they would order their chickens from the milkman. He would bring one with the milk on Friday morning; my mum would spend the morning getting to know her new chicken pal; then her dad would come home for lunch and kill the chicken in preparation for a glorious fried chicken dinner on Sunday. 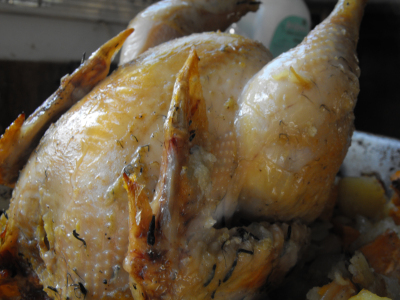 Having only worked with chickens in a feeding and egg-gathering capacity (for other people), I always just figured that the chicken was killed that early because it took a lot of steps to pluck it and ready the meat for cooking . . . or to keep my mum from getting too attached. But waiting for the rigor to go off makes a lot more sense, heh. When it comes to chickens, I feel like our grandparents knew so much that hasn't carried down through books to the current generation. I find it odd that all of the tutorials I've read about butchering chickens haven't mentioned rigor mortis!